To our experience time can be measured on a linear scale such as past, present, and future. But is this really so? If you leave the movement variable out of the equation, Is it not that time lives only in the now, and such any past event is already gone, and any future event is simply speculation that the human mind plays upon itself, since we can only live in the moment, the past we think about only exists in the thoughts we experience now… ironically in the present. We cannot escape our experience of the present, even though the mind continues to play these tricks on us. Memories are only experienced in the now, future speculations are only experienced in the now; so is it just that we are truly only living in the present weather we like it or not, except it or not, realize it or not! It is only that we can change our perception of time, and become lost in our memories, or lost in our potential future that disturbs the basis of how we experience the world. We can become so caught up in routine, that distorts the time judgement mechanism and make us state things like…where has the time gone, time flies, or what did I do with my life? There was an age when we lived by the stars, the celestial planetary time clock we lived by, but today an artificial time clock using a 24 hour measurement has changed things dramatically from that day forward. Also discovered in the field of the Neurosciences are other sequences of measurement in time such as a biological system of time, (the super cosmetic nucleus; a cluster of brain cells that controls our physiological functions). Other findings include neuro-chemical impulses that keep track of time during events that happen before us in our perception; the human ability to judge the passage of time deeply imbedded within our brains. A cosmic notion of time held by physicists believing in the Big-Bang theory gives us a sense of the age old cosmology discussion held by the ancient philosophers. There are atomic time clocks, quantum physics theories of time, and of course the space-time connection with Einstein’s contributions and our relativity in the equation. It can be asserted that time is a specific motion that we employ to measure all other motions. After World War I, and the industrial revolution, public time became crucial in the management of our daily lives. Wearing a wrist watch was a feminine association in past eras, before they became a life saving device, in planning and coordinating attacks in WWI per se. With the study of geriatrics, The secret reward of aging is that we are aware of our mortality, and that we slow down and appreciate life in the moment in the later years of our lives. Respecting the ages of our elders, as well as respecting our place in the scheme of time can be a valuable lesson learned in this fragile world of limited lifespan. The awareness that time is limited, man has searched for a way to escape time, be liberated from time, or exempt from time simply because of the nature of our mortality and time. The B-theory of time is a term, given to one of two positions taken by theorists, in the philosophy of time. The labels, A-theory and B-theory, are derived from the analysis of time and change developed by Cambridge philosopher J. M. E. McTaggart in ‘The Unreality of Time‘ (1908), in which events are ordered via a tensed A-series or a tenseless B-series. Events (or ‘times’), McTaggart observed, may be characterized in two distinct, but related, ways. On the one hand they can be characterized as past, present or future, normally indicated in natural languages such as English by the verbal inflection of tenses or auxiliary adverbial modifiers. Alternatively events may be described as earlier than, simultaneous with, or later than others. Philosophers are divided as to whether the tensed or tenseless mode of expressing temporal fact is fundamental. Those who (like Arthur Prior) take the tensed notions associated with the past, present and future to be the irreducible foundations of temporality and our conceptions of temporal fact, are called A-theorists (similar to presentists). A-theorists deny that past, present and future are equally real, and maintain that the future is not fixed and determinate like the past. Those who wish to eliminate all talk of past, present and future in favour of a tenseless ordering of events are called B-theorists. B-theorists (such as D.H. Mellor and J.J.C. Smart) believe that the past, the present, and the future are equally real. The past, the present and the future feature vary differently in deliberation and reflection. We remember the past and anticipate the future, for example, but not vice versa. B-theorists maintain that the fact that we know much less about the future simply reflects an epistemological difference between the future and the past: the future is no less real than the past; we just know less about it (Mellor 1998). A view was held, for example by Quine and Putnam, that physical theories such as special relativity and latterly Quantum mechanics provide the B-theory with compelling support. A-theorists on the other hand believe that a satisfactory account of time must acknowledge a fundamental metaphysical difference between past, present and future (Prior 2003). The difference between A-theorists and B-theorists is often described as a dispute about temporal passage or ‘becoming’. B-theorists argue that this notion embodies serious confusion about time, while many A-theorists argue that in rejecting temporal ‘becoming’, B-theorists reject time’s most vital and distinctive characteristic. It is common (though not universal) to identify A-theorists’ views with belief in temporal passage. It is also common (though not universal) for B-theorists to be four-dimensionalists, that is, to believe that objects are extended in time as well as in space and therefore have temporal as well as spatial parts. This is sometimes called a time-slice ontology (Clark, 1978). Depending on our perspective, multiple versions of what we call “Now” does exist simultaneously because of the illusory nature of time-space. The subjective moments of experience in the reality of perception may be simply an illusion based on the laws of physics if thinking of it within this context. The notion of the one-directional observation of time, or the arrow of time is an interesting notion. The laws of physics and the notion of entropy help explain why the arrow of time is better seen in one direction. Time is the fourth dimension and a measure in which events can be ordered from the past through the present into the future, and also the measure of durations of events and the intervals between them. Time has long been a major subject of study in religion, philosophy, and science, but defining it in a manner applicable to all fields without circularity has consistently eluded scholars. Nevertheless, diverse fields such as business, industry, sports, the sciences, and the performing arts all incorporate some notion of time into their respective measuring systems. Some simple, relatively uncontroversial definitions of time include “time is what clocks measure” and “time is what keeps everything from happening at once”. Two contrasting viewpoints on time divide many prominent philosophers. One view is that time is part of the fundamental structure of the universe—a dimension independent of events, in which events occur in sequence. Sir Isaac Newton subscribed to this realist view, and hence it is sometimes referred to as Newtonian time. The opposing view is that time does not refer to any kind of “container” that events and objects “move through”, nor to any entity that “flows”, but that it is instead part of a fundamental intellectual structure (together with space and number) within which humans sequence and compare events. This second view, in the tradition of Gottfried Leibniz and Immanuel Kant, holds that time is neither an event nor a thing, and thus is not itself measurable nor can it be travelled. Furthermore, it may be that there is a subjective component to time, but whether or not time itself is “felt”, as a sensation, or is a judgement, is a matter of debate. Temporal measurement has occupied scientists and technologists, and was a prime motivation in navigation and astronomy. Periodic events and periodic motion have long served as standards for units of time. Examples include the apparent motion of the sun across the sky, the phases of the moon, the swing of a pendulum, and the beat of a heart. Currently, the international unit of time, the second, is defined in terms of radiation emitted by caesium atoms (see below). Time is also of significant social importance, having economic value (“time is money“) as well as personal value, due to an awareness of the limited time in each day and in human life spans. Temporal measurement, or chronometry, takes two distinct period forms: the calendar, a mathematical abstraction for calculating extensive periods of time, and the clock, a physical mechanism that counts the ongoing passage of time. In day-to-day life, the clock is consulted for periods less than a day, the calendar, for periods longer than a day. Increasingly, personal electronic devices display both calendars and clocks simultaneously. The number (as on a clock dial or calendar) that marks the occurrence of a specified event as to hour or date is obtained by counting from a fiducial epoch—a central reference point. Artifacts from the Paleolithic suggest that the moon was used to reckon time as early as 6,000 years ago. Lunar calendars were among the first to appear, either 12 or 13 lunar months (either 354 or 384 days). Without intercalation to add days or months to some years, seasons quickly drift in a calendar based solely on twelve lunar months. Lunisolar calendars have a thirteenth month added to some years to make up for the difference between a full year (now known to be about 365.24 days) and a year of just twelve lunar months. The numbers twelve and thirteen came to feature prominently in many cultures, at least partly due to this relationship of months to years. The reforms of Julius Caesar in 45 BC put the Roman world on a solar calendar. This Julian calendar was faulty in that its intercalation still allowed the astronomical solstices and equinoxes to advance against it by about 11 minutes per year. Pope Gregory XIII introduced a correction in 1582; the Gregorian calendar was only slowly adopted by different nations over a period of centuries, but it is now the most commonly used calendar around the world, by far. Planck time unit 5.39 x 10−44 s The duration light takes to travel one Planck length. Theorized to be the smallest duration measurement that will ever be possible, roughly 10−43 seconds. jiffy varies in quantum physics, the duration light takes to travel one fermi (10−15m, about the size of a nucleon) in a vacuum: about 3 × 10−24s. In electronics, the duration for one alternating current power cycle (1/60 or 1/50 of a second). Also, an informal term for any unspecified short duration. shake 10−8 s 10 nanoseconds. Also a casual term for a short duration. moment (historical) 1/40th of an hour used by Medieval Western European computists. month 28–31 days Often 30 days for financial and other calculations. quarter and season 3 months The duration of any of the four calendar seasons; winter, spring, summer and autumn. galactic year Approximately 230 million years The duration it takes the Solar System to orbit the center of the Milky Way Galaxy one time. eon varies on the geological timescale, half a billion years or more. Also “an indefinite and very long period of time”. A large variety of devices has been invented to measure time. The study of these devices is called horology. An Egyptian device that dates to c.1500 BC, similar in shape to a bent T-square, measured the passage of time from the shadow cast by its crossbar on a nonlinear rule. The T was orientated eastward in the mornings. At noon, the device was turned around so that it could cast its shadow in the evening direction. 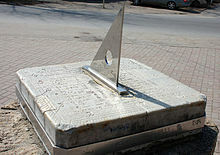 A sundial uses a gnomon to cast a shadow on a set of markings calibrated to the hour. The position of the shadow marks the hour in local time. The most precise timekeeping device of the ancient world was the water clock, or clepsydra, one of which was found in the tomb of Egyptian pharaoh Amenhotep I (1525–1504 BC). They could be used to measure the hours even at night, but required manual upkeep to replenish the flow of water. The Ancient Greeks and the people from Chaldea (southeastern Mesopotamia) regularly maintained timekeeping records as an essential part of their astronomical observations. Arab inventors and engineers in particular made improvements on the use of water clocks up to the Middle Ages. In the 11th century, Chinese inventors and engineers invented the first mechanical clocks driven by an escapement mechanism. The hourglass uses the flow of sand to measure the flow of time. They were used in navigation. Ferdinand Magellan used 18 glasses on each ship for his circumnavigation of the globe (1522). Incense sticks and candles were, and are, commonly used to measure time in temples and churches across the globe. Waterclocks, and later, mechanical clocks, were used to mark the events of the abbeys and monasteries of the Middle Ages. Richard of Wallingford (1292–1336), abbot of St. Alban’s abbey, famously built a mechanical clock as an astronomical orrery about 1330. Great advances in accurate time-keeping were made by Galileo Galilei and especially Christiaan Huygens with the invention of pendulum driven clocks. The English word clock probably comes from the Middle Dutch word klocke which, in turn, derives from the medieval Latin word clocca, which ultimately derives from Celtic and is cognate with French, Latin, and German words that mean bell. The passage of the hours at sea were marked by bells, and denoted the time (see ship’s bell). The hours were marked by bells in abbeys as well as at sea. The 555 timer IC is an integrated circuit (chip) used in a variety of timer, pulse generator and oscillator applications. The most accurate timekeeping devices are atomic clocks, which are accurate to seconds in many millions of years, and are used to calibrate other clocks and timekeeping instruments. Atomic clocks use the spin property of atoms as their basis, and since 1967, the International System of Measurements bases its unit of time, the second, on the properties of caesium atoms. SI defines the second as 9,192,631,770 cycles of the radiation that corresponds to the transition between two electron spin energy levels of the ground state of the 133Cs atom. In medieval philosophical writings, the atom was a unit of time referred to as the smallest possible division of time. The earliest known occurrence in English is in Byrhtferth‘s Enchiridion (a science text) of 1010–1012, where it was defined as 1/564 of a momentum (1½ minutes), and thus equal to 15/94 of a second. It was used in the computus, the process of calculating the date of Easter. The SI base unit for time is the SI second. The International System of Quantities, which incorporates the SI, also defines larger units of time equal to fixed integer multiples of one second (1 s), such as the minute, hour and day. These are not part of the SI, but may be used alongside the SI. Other units of time such as the month and the year are not equal to fixed multiples of 1 s, and instead exhibit significant variations in duration. Time-keeping is so critical to the functioning of modern societies that it is coordinated at an international level. The basis for scientific time is a continuous count of seconds based on atomic clocks around the world, known as the International Atomic Time (TAI). Other scientific time standards include Terrestrial Time and Barycentric Dynamical Time. Coordinated Universal Time (UTC) is the basis for modern civil time. Since 1 January 1972, it has been defined to follow TAI with an exact offset of an integer number of seconds, changing only when a leap second is added to keep clock time synchronized with the rotation of the Earth. In TAI and UTC systems, the duration of a second is constant, as it is defined by the unchanging transition period of the caesium atom. Greenwich Mean Time (GMT) is an older standard, adopted starting with British railways in 1847. Using telescopes instead of atomic clocks, GMT was calibrated to the mean solar time at the Royal Observatory, Greenwich in the UK. Universal Time (UT) is the modern term for the international telescope-based system, adopted to replace “Greenwich Mean Time” in 1928 by the International Astronomical Union. Observations at the Greenwich Observatory itself ceased in 1954, though the location is still used as the basis for the coordinate system. Because the rotational period of Earth is not perfectly constant, the duration of a second would vary if calibrated to a telescope-based standard like GMT or UT—in which a second was defined as a fraction of a day or year. The terms “GMT” and “Greenwich Mean Time” are sometimes used informally to refer to UT or UTC. These conversions are accurate at the millisecond level for time systems involving earth rotation (UT1 & TT). Conversions between atomic time systems (TAI, GPS, and UTC) are accurate at the microsecond level. Sidereal time is the measurement of time relative to a distant star (instead of solar time that is relative to the sun). It is used in astronomy to predict when a star will be overhead. Due to the orbit of the earth around the sun a sidereal day is 4 minutes (1/366th) less than a solar day. – duration as a one of quantities characterizing time interval. Being a quantity, it has value, say, 15 minutes. Other quantities describing a time interval are e.g. dates of its begin and end. From this point of view, the term “time” can be used either as a shorthand or in general sense. Nevertheless, in an exact text like in definitions, proper term should be chosen. Ancient cultures such as Incan, Mayan, Hopi, and other Native American Tribes, plus the Babylonians, Ancient Greeks, Hinduism, Buddhism, Jainism, and others have a concept of a wheel of time, that regards time as cyclical and quantic[clarification needed] consisting of repeating ages that happen to every being of the Universe between birth and extinction. In general, the Judeo-Christian concept, based on the Bible, is that time is linear, beginning with the act of creation by God. The general Christian view is that time will end with the end of the world. The Greek language denotes two distinct principles, Chronos and Kairos. The former refers to numeric, or chronological, time. The latter, literally “the right or opportune moment”, relates specifically to metaphysical or Divine time. In theology, Kairos is qualitative, as opposed to quantitative. In Greek mythology, Chronos (Ancient Greek: Χρόνος) is identified as the Personification of Time. His name in Greek means “time” and is alternatively spelled Chronus (Latin spelling) or Khronos. Chronos is usually portrayed as an old, wise man with a long, gray beard, such as “Father Time”. Some English words whose etymological root is khronos/chronos include chronology, chronometer, chronic, anachronism, synchronize, and chronicle. According to Kabbalists, “time” is a paradox and an illusion. Both the future and the past are recognized to be simultaneously present. Two distinct viewpoints on time divide many prominent philosophers. One view is that time is part of the fundamental structure of the universe, a dimension in which events occur in sequence. Sir Isaac Newton subscribed to this realist view, and hence it is sometimes referred to as Newtonian time. An opposing view is that time does not refer to any kind of actually existing dimension that events and objects “move through”, nor to any entity that “flows”, but that it is instead an intellectual concept (together with space and number) that enables humans to sequence and compare events. This second view, in the tradition of Gottfried Leibniz and Immanuel Kant, holds that space and time “do not exist in and of themselves, but … are the product of the way we represent things”, because we can know objects only as they appear to us. The Vedas, the earliest texts on Indian philosophy and Hindu philosophy dating back to the late 2nd millennium BC, describe ancient Hindu cosmology, in which the universe goes through repeated cycles of creation, destruction and rebirth, with each cycle lasting 4320 million years. Ancient Greek philosophers, including Parmenides and Heraclitus, wrote essays on the nature of time. Plato, in the Timaeus, identified time with the period of motion of the heavenly bodies. Aristotle, in Book IV of his Physica defined time as ‘number of movement in respect of the before and after’. Immanuel Kant, in the Critique of Pure Reason, described time as an a priori intuition that allows us (together with the other a priori intuition, space) to comprehend sense experience. With Kant, neither space nor time are conceived as substances, but rather both are elements of a systematic mental framework that necessarily structures the experiences of any rational agent, or observing subject. Kant thought of time as a fundamental part of an abstract conceptual framework, together with space and number, within which we sequence events, quantify their duration, and compare the motions of objects. In this view, time does not refer to any kind of entity that “flows,” that objects “move through,” or that is a “container” for events. Spatial measurements are used to quantify the extent of and distances between objects, and temporal measurements are used to quantify the durations of and between events. Time was designated by Kant as the purest possible schema of a pure concept or category. According to Martin Heidegger we do not exist inside time, we are time. Hence, the relationship to the past is a present awareness of having been, which allows the past to exist in the present. The relationship to the future is the state of anticipating a potential possibility, task, or engagement. It is related to the human propensity for caring and being concerned, which causes “being ahead of oneself” when thinking of a pending occurrence. Therefore, this concern for a potential occurrence also allows the future to exist in the present. The present becomes an experience, which is qualitative instead of quantitative. Heidegger seems to think this is the way that a linear relationship with time, or temporal existence, is broken or transcended. We are not stuck in sequential time. We are able to remember the past and project into the future – we have a kind of random access to our representation of temporal existence — we can, in our thoughts, step out of (ecstasis) sequential time. In 5th century BC Greece, Antiphon the Sophist, in a fragment preserved from his chief work On Truth, held that: “Time is not a reality (hypostasis), but a concept (noêma) or a measure (metron).” Parmenides went further, maintaining that time, motion, and change were illusions, leading to the paradoxes of his follower Zeno. Time as an illusion is also a common theme in Buddhist thought. J. M. E. McTaggart‘s 1908 The Unreality of Time argues that, since every event has the characteristic of being both present and not present (i.e., future or past), that time is a self-contradictory idea (see also The flow of time). Until Einstein’s profound reinterpretation of the physical concepts associated with time and space, time was considered to be the same everywhere in the universe, with all observers measuring the same time interval for any event. Non-relativistic classical mechanics is based on this Newtonian idea of time. 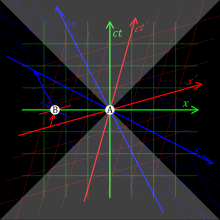 The theory of special relativity finds a convenient formulation in Minkowski spacetime, a mathematical structure that combines three dimensions of space with a single dimension of time. In this formalism, distances in space can be measured by how long light takes to travel that distance, e.g., a light-year is a measure of distance, and a meter is now defined in terms of how far light travels in a certain amount of time. Two events in Minkowski spacetime are separated by an invariant interval, which can be either space-like, light-like, or time-like. Events that are time-like cannot be simultaneous in any frame of reference, there must be a temporal component (and possibly a spatial one) to their separation. Events that are space-like could be simultaneous in some frame of reference, and there is no frame of reference in which they do not have a spatial separation. People travelling at different velocities between two events measure different spatial and temporal separations between the events, but the invariant interval is constant and independent of velocity. In non-relativistic classical mechanics, Newton’s concept of “relative, apparent, and common time” can be used in the formulation of a prescription for the synchronization of clocks. Events seen by two different observers in motion relative to each other produce a mathematical concept of time that works sufficiently well for describing the everyday phenomena of most people’s experience. In the late nineteenth century, physicists encountered problems with the classical understanding of time, in connection with the behavior of electricity and magnetism. Einstein resolved these problems by invoking a method of synchronizing clocks using the constant, finite speed of light as the maximum signal velocity. This led directly to the result that observers in motion relative to one another measure different elapsed times for the same event. Time has historically been closely related with space, the two together merging into spacetime in Einstein’s special relativity and general relativity. According to these theories, the concept of time depends on the spatial reference frame of the observer, and the human perception as well as the measurement by instruments such as clocks are different for observers in relative motion. For example, if a spaceship carrying a clock flies through space at (very nearly) the speed of light, its crew does not notice a change in the speed of time on board their vessel because everything traveling at the same speed slows down at the same rate (including the clock, the crew’s thought processes, and the functions of their bodies). However, to a stationary observer watching the spaceship fly by, the spaceship appears flattened in the direction it is traveling and the clock on board the spaceship appears to move very slowly. On the other hand, the crew on board the spaceship also perceives the observer as slowed down and flattened along the spaceship’s direction of travel, because both are moving at very nearly the speed of light relative to each other. Because the outside universe appears flattened to the spaceship, the crew perceives themselves as quickly traveling between regions of space that (to the stationary observer) are many light years apart. This is reconciled by the fact that the crew’s perception of time is different from the stationary observer’s; what seems like seconds to the crew might be hundreds of years to the stationary observer. In either case, however, causality remains unchanged: the past is the set of events that can send light signals to an entity and the future is the set of events to which an entity can send light signals. Einstein showed in his thought experiments that people travelling at different speeds, while agreeing on cause and effect, measure different time separations between events, and can even observe different chronological orderings between non-causally related events. Though these effects are typically minute in the human experience, the effect becomes much more pronounced for objects moving at speeds approaching the speed of light. Many subatomic particles exist for only a fixed fraction of a second in a lab relatively at rest, but some that travel close to the speed of light can be measured to travel farther and survive much longer than expected (a muon is one example). According to the special theory of relativity, in the high-speed particle’s frame of reference, it exists, on the average, for a standard amount of time known as its mean lifetime, and the distance it travels in that time is zero, because its velocity is zero. Relative to a frame of reference at rest, time seems to “slow down” for the particle. Relative to the high-speed particle, distances seem to shorten. Einstein showed how both temporal and spatial dimensions can be altered (or “warped”) by high-speed motion. Views of spacetime along the world line of a rapidly accelerating observer in a relativistic universe. 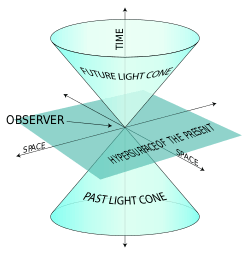 The events (“dots”) that pass the two diagonal lines in the bottom half of the image (the past light cone of the observer in the origin) are the events visible to the observer. In the figures, the vertical direction indicates time. The horizontal direction indicates distance (only one spatial dimension is taken into account), and the thick dashed curve is the spacetime trajectory (“world line“) of the observer. The small dots indicate specific (past and future) events in spacetime. In the Newtonian description these changes are such that time is absolute: the movements of the observer do not influence whether an event occurs in the ‘now’ (i.e., whether an event passes the horizontal line through the observer). Time appears to have a direction—the past lies behind, fixed and immutable, while the future lies ahead and is not necessarily fixed. Yet for the most part the laws of physics do not specify an arrow of time, and allow any process to proceed both forward and in reverse. This is generally a consequence of time being modeled by a parameter in the system being analyzed, where there is no “proper time”: the direction of the arrow of time is sometimes arbitrary. Examples of this include the Second law of thermodynamics, which states that entropy must increase over time (see Entropy); the cosmological arrow of time, which points away from the Big Bang, CPT symmetry, and the radiative arrow of time, caused by light only traveling forwards in time (see light cone). In particle physics, the violation of CP symmetry implies that there should be a small counterbalancing time asymmetry to preserve CPT symmetry as stated above. The standard description of measurement in quantum mechanics is also time asymmetric (see Measurement in quantum mechanics). 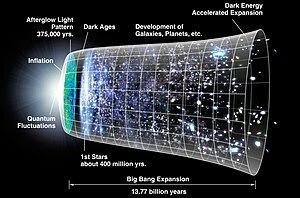 Scientists have come to some agreement on descriptions of events that happened 10−35 seconds after the Big Bang, but generally agree that descriptions about what happened before one Planck time (5 × 10−44 seconds) after the Big Bang are likely to remain pure speculation. While the Big Bang model is well established in cosmology, it is likely to be refined in the future. Little is known about the earliest moments of the universe’s history. The Penrose–Hawking singularity theorems require the existence of a singularity at the beginning of cosmic time. However, these theorems assume that general relativity is correct, but general relativity must break down before the universe reaches the Planck temperature, and a correct treatment of quantum gravity may avoid the singularity. Brane cosmology models in which inflation is due to the movement of branes in string theory; the pre-big bang model; the ekpyrotic model, in which the Big Bang is the result of a collision between branes; and the cyclic model, a variant of the ekpyrotic model in which collisions occur periodically. Chaotic inflation, in which inflation events start here and there in a random quantum-gravity foam, each leading to a bubble universe expanding from its own big bang. Time travel is the concept of moving backwards or forwards to different points in time, in a manner analogous to moving through space, and different from the normal “flow” of time to an earthbound observer. In this view, all points in time (including future times) “persist” in some way. Time travel has been a plot device in fiction since the 19th century. Traveling backwards in time has never been verified, presents many theoretic problems, and may be an impossibility. Any technological device, whether fictional or hypothetical, that is used to achieve time travel is known as a time machine. Another solution to the problem of causality-based temporal paradoxes is that such paradoxes cannot arise simply because they have not arisen. As illustrated in numerous works of fiction, free will either ceases to exist in the past or the outcomes of such decisions are predetermined. As such, it would not be possible to enact the grandfather paradox because it is a historical fact that your grandfather was not killed before his child (your parent) was conceived. This view doesn’t simply hold that history is an unchangeable constant, but that any change made by a hypothetical future time traveler would already have happened in his or her past, resulting in the reality that the traveler moves from. More elaboration on this view can be found in the Novikov self-consistency principle. The brain’s judgement of time is known to be a highly distributed system, including at least the cerebral cortex, cerebellum and basal ganglia as its components. One particular component, the suprachiasmatic nuclei, is responsible for the circadian (or daily) rhythm, while other cell clusters appear capable of shorter-range (ultradian) timekeeping. Psychoactive drugs can impair the judgement of time. Stimulants can lead both humans and rats to overestimate time intervals, while depressants can have the opposite effect. The level of activity in the brain of neurotransmitters such as dopamine and norepinephrine may be the reason for this. Such chemicals will either excite or inhibit the firing of neurons in the brain, with a greater firing rate allowing the brain to register the occurrence of more events within a given interval (speed up time) and a decreased firing rate reducing the brain’s capacity to distinguish events occurring within a given interval (slow down time). Children’s expanding cognitive abilities allow them to understand time more clearly. Two and three year olds’ understanding of time is mainly limited to “now and not now.” Five and six year olds can grasp the ideas of past, present, and future. Seven to ten year olds can use clocks and calendars. In addition to psychoactive drugs, judgements of time can be altered by temporal illusions (like the kappa effect), age, and hypnosis. The sense of time is impaired in some people with neurological diseases such as Parkinson’s disease and attention deficit disorder. The use of time is an important issue in understanding human behavior, education, and travel behavior. Time use research is a developing field of study. The question concerns how time is allocated across a number of activities (such as time spent at home, at work, shopping, etc.). Time use changes with technology, as the television or the Internet created new opportunities to use time in different ways. However, some aspects of time use are relatively stable over long periods of time, such as the amount of time spent traveling to work, which despite major changes in transport, has been observed to be about 20–30 minutes one-way for a large number of cities over a long period. Uses of a sequence of events include stories, historical events (chronology), directions and steps in procedures, and timetables for scheduling activities. A sequence of events may also be used to help describe processes in science, technology, and medicine. A sequence of events may be focused on past events (e.g., stories, history, chronology), on future events that must be in a predetermined order (e.g., plans, schedules, procedures, timetables), or focused on the observation of past events with the expectation that the events will occur in the future (e.g., processes). The use of a sequence of events occurs in fields as diverse as machines (cam timer), documentaries (Seconds From Disaster), law (choice of law), computer simulation (discrete event simulation), and electric power transmission (sequence of events recorder). A specific example of a sequence of events is the timeline of the Fukushima Daiichi nuclear disaster. Le Poidevin, Robin (Winter 2004). “The Experience and Perception of Time”. In Edward N. Zalta. The Stanford Encyclopedia of Philosophy. Retrieved 9 April 2011. Sean M Carroll (2009). From Eternity to Here: The Quest for the Ultimate Theory of Time. Dutton. ISBN 978-0-525-95133-9. Cummings, Raymond King (1922). The Girl in the Golden Atom. U of Nebraska Press. p. 46. ISBN 978-0-8032-6457-1. Retrieved 9 April 2011. Chapter 5. Cummings repeated this sentence in several of his novellas. Sources, such as this one, attribute it to his earlier work, The Time Professor, in 1921. Before taking book form, several of Cummings’s stories appeared serialized in magazines. The first eight chapters of his The Girl in the Golden Atom appeared in All-Story Magazine on 15 March 1919. In the novel version the quote about time appears in Chapter V.
Davies, Davies (1995). About time: Einstein’s unfinished revolution. Simon & Schuster. p. 236. ISBN 0-671-79964-9. Retrieved 9 April 2011. Lehar, Steve. (2000). The Function of Conscious Experience: An Analogical Paradigm of Perception and Behavior, Consciousness and Cognition. Richards, E. G. (1998). Mapping Time: The Calendar and its History. Oxford University Press. pp. 3–5. Rudgley, Richard (1999). The Lost Civilizations of the Stone Age. New York: Simon & Schuster. pp. 86–105. Bacon, Roger. Opera quaedam hactenus inedita. Harvard University. Retrieved 5 July 2014. “Aeon – Definition and More from the Free Merriam-Webster Dictionary”. Merriam-webster.com. 31 August 2012. Retrieved 24 September 2013. Watson, E (1979) “The St Albans Clock of Richard of Wallingford”. Antiquarian Horology 372–384. 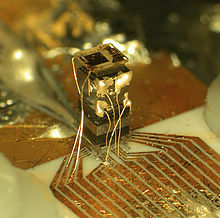 “NIST Unveils Chip-Scale Atomic Clock”. 27 August 2004. Retrieved 9 June 2011. “New atomic clock can keep time for 200 million years: Super-precise instruments vital to deep space navigation”. Vancouver Sun. 16 February 2008. Retrieved 9 April 2011. “12 attoseconds is the world record for shortest controllable time”. 12 May 2010. Retrieved 19 April 2012. Organisation Intergouvernementale de la Convention du Métre (1998). The International System of Units (SI), 7th Edition (PDF). Retrieved 9 April 2011. “Base unit definitions: Second”. NIST. Retrieved 9 April 2011. Hus, Boʿaz; Pasi, Marco; Von Stuckrad, Kocku (2011). Kabbalah and Modernity: Interpretations, Transformations, Adaptations. BRILL. ISBN 9004182845. Navratil, Gerhard (2009). Research Trends in Geographic Information Science. Springer Japan. p. 217. ISBN 3-540-88243-X. Retrieved 9 April 2011. Augustine of Hippo. Confessions. Retrieved 9 April 2011. Book 11, Chapter 14. Bergson, Henri (1907) Creative Evolution. trans. by Arthur Mitchell. Mineola: Dover, 1998. Balslev, Anindita N.; Jitendranath Mohanty (November 1992). Religion and Time. Studies in the History of Religions, 54. The Netherlands: Brill Academic Publishers. pp. 53, 54, 55, 56, 57, 58, and 59. ISBN 978-90-04-09583-0. Martin Heidegger (1962). “V”. Being and Time. p. 425. ISBN 978-0-631-19770-6. Harry Foundalis. “You are about to disappear”. Retrieved 9 April 2011. Huston, Tom. “Buddhism and the illusion of time”. Retrieved 9 April 2011. Garfield, Jay L. (1995). The fundamental wisdom of the middle way: Nāgārjuna’s Mūlamadhyamakakārikā. New York: Oxford University Press. ISBN 978-0-19-509336-0. “Time is an illusion?”. Retrieved 9 April 2011. A. Einstein, H. A. Lorentz, H. Weyl, H. Minkowski, The Principle of Relativity, Dover Publications, Inc, 2000, softcover 216 pages, ISBN 0-486-60081-5, See pp. 37–65 for an English translation of Einstein’s original 1905 paper. “Albert Einstein’s Theory of Relativity”. YouTube. 30 November 2011. Retrieved 24 September 2013. “Time Travel: Einstein’s big idea (Theory of Relativity)”. YouTube. 9 January 2007. Retrieved 24 September 2013. Hours, After (11 February 2012). “7 Theories on Time That Would Make Doc Brown’s Head Explode”. Cracked.com. Retrieved 24 September 2013. Mughal, Muhammad Aurang Zeb. 2009. Time, Absolute. H. James Birx (ed. ), Encyclopedia of Time: Science, Philosophy, Theology, and Culture, Vol. 3. Thousand Oaks, CA: Sage, pp. 1254-1255. Adler, Mortimer J., PhD. “Natural Theology, Chance, and God”. Retrieved 9 April 2011. “Hawking could have avoided the error of supposing that time had a beginning with the Big Bang if he had distinguished time as it is measured by physicists from time that is not measurable by physicists…. an error shared by many other great physicists in the twentieth century, the error of saying that what cannot be measured by physicists does not exist in reality.” “The Great Ideas Today”. Encyclopædia Britannica. 1992. Adler, Mortimer J., PhD. “Natural Theology, Chance, and God”. Retrieved 9 April 2011. “Where Einstein had said that what is not measurable by physicists is of no interest to them, Hawking flatly asserts that what is not measurable by physicists does not exist—has no reality whatsoever. With respect to time, that amounts to the denial of psychological time which is not measurable by physicists, and also to everlasting time—time before the Big Bang—which physics cannot measure. Hawking does not know that both Aquinas and Kant had shown that we cannot rationally establish that time is either finite or infinite.” “The Great Ideas Today”. Encyclopædia Britannica. 1992. J. Hartle and S. W. Hawking (1983). “Wave function of the universe”. Phys. Rev. D 28 (12): 2960. Bibcode:1983PhRvD..28.2960H. doi:10.1103/PhysRevD.28.2960. Langlois, David (2002). “Brane cosmology: an introduction”. Progress of Theoretical Physics Supplement 148: 181. arXiv:hep-th/0209261. Bibcode:2002PThPS.148..181L. doi:10.1143/PTPS.148.181. Linde, Andre (2002). “Inflationary Theory versus Ekpyrotic/Cyclic Scenario”. In: the future of theoretical physics and cosmology. Edited by G. W. Gibbons: 801. arXiv:hep-th/0205259. Bibcode:2003ftpc.book..801L. “Recycled Universe: Theory Could Solve Cosmic Mystery”. Space.com. 8 May 2006. Retrieved 9 April 2011. “What Happened Before the Big Bang?”. Archived from the original on 4 July 2007. Retrieved 9 April 2011. A. Linde (1986). “Eternal chaotic inflation”. Mod. Phys. Lett. A1 (2): 81. Bibcode:1986MPLA….1…81L. doi:10.1142/S0217732386000129. A. Linde (1986). “Eternally existing self-reproducing chaotic inflationary universe”. Phys. Lett. B175 (4): 395–400. Bibcode:1986PhLB..175..395L. doi:10.1016/0370-2693(86)90611-8. Andersen, Holly; Rick Grush (pending). 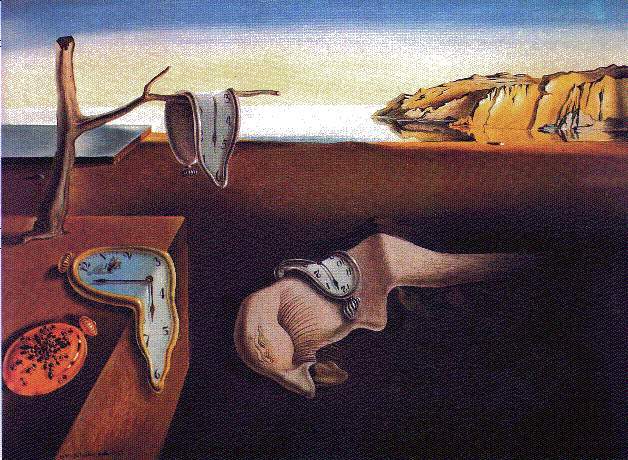 A brief history of time-consciousness: historical precursors to James and Husserl (PDF). Journal of the History of Philosophy. Retrieved 9 April 2011. Wittmann, M.; Leland DS; Churan J; Paulus MP. (8 October 2007). “Impaired time perception and motor timing in stimulant-dependent subjects” (online abstract). Drug Alcohol Depend. 90 (2–3): 183–92. doi:10.1016/j.drugalcdep.2007.03.005. PMC 1997301. PMID 17434690. Cheng, Ruey-Kuang; Macdonald, Christopher J.; Meck, Warren H. (2006). “Differential effects of cocaine and ketamine on time estimation: Implications for neurobiological models of interval timing” (online abstract). Pharmacology, biochemistry and behavior 85 (1): 114–122. doi:10.1016/j.pbb.2006.07.019. PMID 16920182. Retrieved 9 April 2011. Tinklenberg, Jared R.; Walton T. Roth1; Bert S. Kopell (January 1976). “Marijuana and ethanol: Differential effects on time perception, heart rate, and subjective response”. Psychopharmacology 49 (3): 275–279. doi:10.1007/BF00426830. PMID 826945. Retrieved 9 April 2011. Arzy, Shahar; Istvan Molnar-Szakacs; Olaf Blanke (18 June 2008). “Self in Time: Imagined Self-Location Influences Neural Activity Related to Mental Time Travel” (Abstract). The Journal of Neuroscience 28 (25): 6502–6507. doi:10.1523/JNEUROSCI.5712-07.2008. 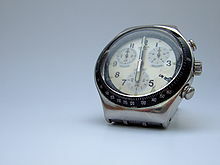 PMID 18562621. Retrieved 9 April 2011. Carter, Rita (2009). The Human Brain Book. Dorling Kindersley Publishing. pp. 186–187. ISBN 978-0-7566-5441-2. Kennedy-Moore, Eileen (28 March 2014). “Time Management for Kids”. Psychology Today. Retrieved 26 April 2014. Robert, Adler. “Look how time flies..”. Retrieved 9 April 2011. Bowers, Kenneth; Brenneman, HA (January 1979). “Hypnosis and the perception of time”. International Journal of Clinical and Experimental Hypnosis (International Journal of Clinical and Experimental Hypnosis) 27 (1): 29–41. doi:10.1080/00207147908407540. PMID 541126. “Sequence – Order of Important Events”. Austin Independent School District. 2009. “Sequence of Events Worksheets”. Reference.com. Compiled by David Luckham and Roy Schulte. “Event Processing Glossary—Version 2.0”. Complex Event Processing. David J. Piasecki. “Inventory Accuracy Glossary”. AccuracyBook.com (OPS Publishing). “Utility Communications Architecture (UCA) glossary”. NettedAutomation. Davies, Paul (1996). About Time: Einstein’s Unfinished Revolution. New York: Simon & Schuster Paperbacks. ISBN 0-684-81822-1. Galison, Peter (1992). Einstein’s Clocks and Poincaré’s Maps: Empires of Time. New York: W. W. Norton. ISBN 0-393-02001-0. Highfield, Roger (1992). Arrow of Time: A Voyage through Science to Solve Time’s Greatest Mystery. Random House. ISBN 0-449-90723-6. Mermin, N. David (2005). It’s About Time: Understanding Einstein’s Relativity. Princeton University Press. ISBN 0-691-12201-6. Penrose, Roger (1999) . The Emperor’s New Mind: Concerning Computers, Minds, and the Laws of Physics. New York: Oxford University Press. pp. 391–417. ISBN 0-19-286198-0. Retrieved 9 April 2011. Price, Huw (1996). Time’s Arrow and Archimedes’ Point. Oxford University Press. ISBN 0-19-511798-0. Retrieved 9 April 2011. Quznetsov, Gunn A. (2006). Logical Foundation of Theoretical Physics. Nova Sci. Publ. ISBN 1-59454-948-6. Dowden, Bradley (California State University, Sacramento) (2007). “Time”. In James Fieser, PhD, Bradley Dowden, PhD. The Internet Encyclopedia of Philosophy. Retrieved 9 April 2011. We now live in a world that has become much, much smaller than in times before present day. Technology has dramatically changed, and the social engineering bee’s have been secretly at work using their sophist influences on the political systems around the world. Unfortunately the Draconian measures to deal with people has not left us and is profoundly influencing many of our political systems. Media sources have been corrupted, corporations have been corrupted, social institutions and politicians have been corrupted therefore influencing legislative law-makers who in turn have been corrupted, ad infinitum. Most people do not want to see how deep the rabbit hole goes. Much distraction is in hefty supply, much disinformation of convoluted materials dissuade the equations in social commentary, and preparations for the future under the guise of benign agendas are being forged behind the scrutiny of the public, thus executing very discreet contexts squeezing out any dissension that may come when people wake up to the betrayal of their own governments. I am but a simple man, facing the enormity of a world in the grips of an influence that often takes many of us down to its levels when we feel compelled to comply with the principle-less fools who live by a different set of rules. Belief in yourself is a crucial factor to create a social net of resistance to those who partake in these fictions interjected into our lives like a virus by the controlling factions that oversee the powerless. Holding up your head at a time of conflict and rejecting the current status quo will result in several possibly different scenarios as our history has decreed time and time again depending on the political environment, agendas of those in power, and country or continent. One scenario may imprison you, (in body, or mind, or both), or one that may free you, (of persecution, of dependence, or of your life in your death), or lastly, one that will enslave you if you concede your mind to these political tales of malfeasance but allowed to continue as you normally have known it to be, (allowed to go about your everyday life but with permission). More and more talk lately about American civil liberties we fought for being eroded by the a secret elite who are not only above the law, but more precisely own the laws and dictate which laws they will follow, and which ones they choose not to follow. Agenda 21, Codex Alimentarius, Climate Change AKA Global Warming, Green taxes, Chem-trails and the fluoridation of 66% of American water works, Executive Orders allowing secret experimentation on humans in civil and military contexts, the suppression of Health Care via undisclosed cures for many aliments by FDA influences and the money made on the sick, by the peddlers from Big-Pharma drug companies and Health Care Associations continues to dominate and perpetuate given ‘Carte Blanche’ treatment over the citizens of the world. The use of the media sources to control public opinion, the militarization of the police, the empowerment of the United Nations for global disputes has been on the rise in this century. You can easily see the world if you do not wear the blinders of your masters. If you do not take for granted what has been fought for, and do not accept the proposals of the governing body, and if we connect with others that have the same perspectives, than a chance to keep the immoral forces upon us at a distance is strengthened. To some this may sound like a science fiction tale, but to others it is fact that will largely determine our lives. The evidence for these statements lies in our demonstration of this dynamic in our human history, thus that we are indeed human given all of our frailties. We have seen many times in our history that atrocities perpetrated have conquered the less prepared, that those in power have used their will to subdue others age after age in history and it is foolish to believe that we have evolved from that level of thinking over the very short time of the human history we know of. What has evolved is how this enslavement is being undertaken by those who wish to dominate us. One professor has this take on our history and teaches this in his course. 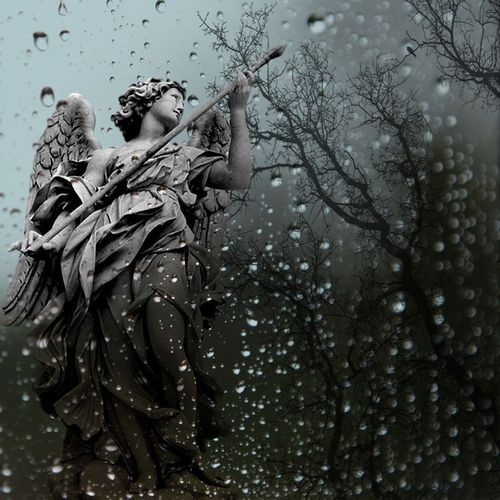 · We rule the world because we are the only animal that can believe in things that exist purely in our own imagination, such as gods, states, money and human rights. · Humans are ecological serial killers – even with stone-age tools, our ancestors wiped out half the planet’s large terrestrial mammals well before the advent of agriculture. · The Agricultural Revolution was history’s biggest fraud – wheat domesticated Sapiens rather than the other way around. · Money is the most universal and pluralistic system of mutual trust ever devised. Money is the only thing everyone trusts. · Empire is the most successful political system humans have invented, and our present era of anti-imperial sentiment is probably a short-lived aberration. · Capitalism is a religion rather than just an economic theory – and it is the most successful religion to date. · The treatment of animals in modern agriculture may turn out to be the worst crime in history. · We are far more powerful than our ancestors, but we aren’t much happier. · Humans will soon disappear. With the help of novel technologies, within a few centuries or even decades, Humans will upgrade themselves into completely different beings, enjoying godlike qualities and abilities. 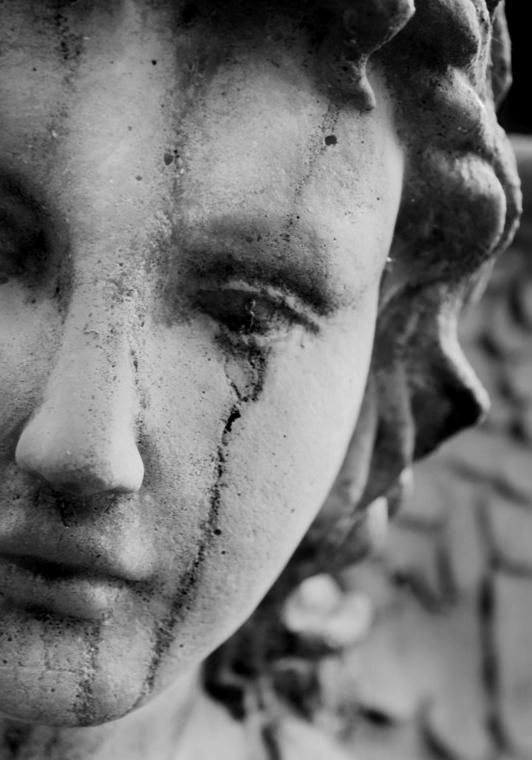 History began when humans invented gods – and will end when humans become gods.